BEVERLY HILLS, Calif. - Jan. 17, 2006 -- Hilton Hotels Corporation (NYSE:HLT) has announced that the company is introducing a new luxury hotel line that will extend the cachet of New York's legendary Waldorf=Astoria® hotel. All four resplendent hotels will maintain their established, well-known names, while adding The Waldorf=Astoria Collection designation as a mark of their exclusivity. Hotels within The Waldorf=Astoria Collection will benefit from the support of award-winning technology programs, the Hilton HHonors® guest reward program, the industry-leading Hilton Reservations Worldwide system, eBusiness programs, worldwide sales and marketing programs, and operations support. The Waldorf=Astoria hotel is wholly owned by Hilton Hotels Corporation, and the Grand Wailea, Arizona Biltmore and La Quinta properties are owned by Orlando-based CNL Hotels & Resorts, Inc., a leading hotel real estate investment trust (REIT). Hilton Hotels Corporation will acquire the three management contracts from La Quinta, Calif.-based KSL Resorts, which currently manages the three luxury hotels. "The Waldorf=Astoria Collection will build upon a deeply established and highly reputable hospitality name -- the Waldorf=Astoria -- that represents one of the cornerstones of our company's history," said Matthew J. Hart, president and chief operating officer of Hilton Hotels Corporation. "We will take this world-renowned name to new heights as we develop a new line of business that has significant growth potential and that we anticipate will have enormous appeal to current and prospective hotel owners and developers worldwide." "The extension of the legendary Waldorf=Astoria designation to three of our premier destination resorts is an exciting undertaking that we expect will take these properties to even higher levels of sophistication," said Thomas J. Hutchison III, chief executive officer of CNL Hotels & Resorts. "We are particularly pleased to showcase this exclusive world-class designation within our portfolio of distinctive assets and to further our strong relationship with Hilton." Criteria for the exclusive designation of The Waldorf=Astoria Collection will include architectural significance, unique decor and original artwork, historic or landmark status and a reputation for product and service excellence. Opening new-build hotels or hotel/residential developments in gateway cities using the Waldorf=Astoria brand name itself to provide prestige and elegance, globally. The company will seek management contracts for truly special hotels in select markets, using the Waldorf=Astoria brand name. The company's Conrad brand, with 19 world-class luxury hotels and resorts operating in the United States, England, Ireland, Belgium, Egypt, Turkey, Indonesia, Hong Kong, Singapore, Thailand, Australia and Uruguay, will continue to grow through management contracts. Plans for new Conrad Hotels, both in major U.S. cities and resort destinations around the world, are in various stages of development and the brand continues to remain strong. 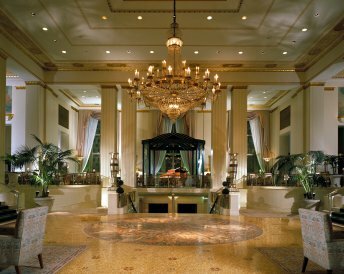 The Waldorf=Astoria offers 1,245 rooms, including 197 suites. The Waldorf Towers, a hotel within a hotel, offers a total of 180 rooms, including 101 suites. 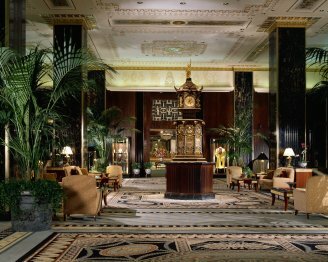 Representing one of the first "grand hotels," the Waldorf=Astoria has been world renowned for more than a century. The hotel was the first of its kind to give prominence to the Art Deco style in America. Today, the exterior and interior design are acknowledged as masterpieces of this art genre. The New York City Landmark recently unveiled numerous original Art Deco treasures as part of its renovation. The jewel of the Waldorf=Astoria's lobby, Peacock Alley®, just concluded an extensive, Deco-inspired renovation and redesign. The new venue includes a restaurant, a bar and two private dining rooms, and combines the Waldorf=Astoria's classic surroundings with a fresh, contemporary look. An award-winning and world-famous property, the Grand Wailea Resort Hotel & Spa in Maui, Hawaii, includes 780 guest rooms and 100,000 square feet of meeting space. Situated on 40 meticulously landscaped acres, the Grand Wailea Resort Hotel & Spa opens onto Maui's beautiful Wailea Beach, voted one of the best beaches in Hawaii and America. Averaging 640 square feet of luxuriously appointed accommodations, each guest room features a private lanai (balcony), Italian marble bathroom with oversized bathtub and separate glass enclosed shower, sitting area and writing desk. The acclaimed Wailea Canyon's four activity pools include tile slides, a white water rapids slide, a Tarzan pool with rope swing, the world's only water elevator, a sand beach, six waterfalls, caves, three Jacuzzis, a sauna and an infant pool. Additionally, its renowned Hibiscus Pool is an architectural achievement. The resort's Spa Grande is noted among the Top 10 Spas in the United States by Conde Nast Traveler and Travel & Leisure magazines. An extensive art collection complements the resort, consisting of more than 80 works including original paintings, sculpture, graphics, murals and artifacts. Known throughout the world as the "Jewel of the Desert," the Arizona Biltmore Resort & Spa provides a restful oasis nestled on 39 acres at the foot of the Phoenix Mountain Preserve and covered with lush gardens, glistening swimming pools, and Frank Lloyd Wright-influenced architecture. Considered one of the most spectacular resorts in the world, the Arizona Biltmore features 738 guest accommodations, including 78 one- and two-bedroom villas, eight swimming pools, seven tennis courts, an 18-hole putting course, and a full-service European spa, offering more than 22,000 square feet of outdoor retreat areas and cascading whirlpools, salon and state-of-the-art fitness center. The adjacent Arizona Biltmore Country Club offers two 18-hole PGA golf courses, The Links and The Adobe. The only hotel to have an incorporated city named after it, the legendary La Quinta Resort & Club has preserved the charm and serene ambiance of its glorious past while offering guests the finest in resort amenities and services, including five resort golf courses, one of the nation's top tennis clubs, a full-service spa and fitness center, exclusive dining and resort shopping. La Quinta Resort & Club features 90 holes of some of the country's best golf, including the famous TPC® Stadium Golf ® Course at PGA WEST® and the picturesque Mountain(TM) Course at La Quinta Resort. The resort features 23 tennis courts, 42 pools, 52 hot tubs, five restaurants and 800 guest rooms tucked away in 640 charming Spanish-style casitas. La Quinta Resort & Club's luxurious suites feature a limited-use kitchen, fully loaded iPod and Bose Docking Station, and spacious accommodations. About CNL Hotels & Resorts, Inc.
CNL Hotels & Resorts, Inc., the nation's second largest hotel REIT, owns one of the most distinctive portfolios in the lodging industry. With a focus on luxury resorts and upper-upscale properties, the company has nearly $5.5 billion in total assets with 92 hotels and resorts across North America that operate under independent and major hospitality brands. For more information, please visit www.cnlhotels.com. Hilton Hotels Corporation is recognized internationally as a preeminent hospitality company. The company develops, owns, manages or franchises more than 2,300 hotels, resorts and vacation ownership properties. Its portfolio includes many of the world's best known and most highly regarded hotel brands, including Hilton®, Conrad®, Doubletree®, Embassy Suites Hotels®, Hampton Inn®, Hampton Inn & Suites®, Hilton Garden Inn®, Hilton Grand Vacations Club®, Homewood Suites by Hilton® and The Waldorf=Astoria Collection. For more information about our company, please visit our corporate website at www.hiltonfamily.com.